Proceed forward, obtain the SAF .45, and take cover. Allow the sentries to advance to your position. Eliminate them (4) as they attack you. Proceed to the end of the courtyard and obtain additional SAF .45 ammunition. Turn right, locate the keypad, and approach and activate it. To unlock the gate, you must mimic the green arrows with your keyboard arrow keys. Do so four times and the gate will unlock. Proceed slowly. Retreat when the motorboat passes to avoid gunfire. Proceed to the dock and take cover behind the wall. Eliminate the guards with well-placed shots to either gas canisters. Turn around – an enemy will rush through the locked doors. Eliminate him and enter inside. Climb the right-side staircase and approach the security center – specifically the device with a blinking red light. Patch into the cameras. Turn left and exit through the newly opened door. Ascend the staircases and sprint through the greenhouse. Afterward, turn left and proceed through the vineyard. Upon exiting, you will view another large greenhouse. Enter (sprint) via the center door and immediately take cover behind a wooden shelf. Eliminate the security team. Incinerate the enemies via destroying the left-side gas tank, if needed. Be wary of an additional security team that will approach from the side. Change cover locations often or enemies will flank you or throw grenades. Upon eliminating the security team, the greenhouse exit will open. Exit the greenhouse. Ascend the staircases and proceed to the villa’s right side. Upon doing so, notice the right-side second-floor balcony. (This is only visible from close range.) A sentry will attempt to eliminate you from that position. Kill him and his body will open the entrance to the cellar. Enter the cellar and proceed left down the winding hall. If needed, obtain the shotgun located in the second left-side room. In the main room, take cover behind barrels and pillars and eliminate the guards. Proceed to the opposite end of the room. Climb the ascending staircase to your right. In the octagonal room, proceed left and ascend the staircase to reach the kitchen. Take cover and eliminate the dining room guards. Proceed to the dining room, turn right, enter the large stately room, turn left, and take cover behind the counter. Eliminate the sentries – one in front, one left. Proceed upstairs and ascend the left-side staircase. Walk forward, turn right, and eliminate the sentry. Proceed down the hall and turn right to enter White’s library. Proceed to the empty safe and activate it to open a secret passage. Enter the secret passage and approach the primary computer system, and hack into White’s computer. To escape the burning villa, run right. Turn left and walk around the large gap. Turn left and descend the staircase to the first floor. Turn right and proceed to the opposite side of the room. Upon doing so, the wall will explode to reveal a second room. Proceed through the second room to exit the villa. Ascend the staircase to the helipad and shoot the helicopter until a cinematic is triggered. Exit through the room the assassin did and descend the staircase. You will fall into a flooded room. Enter the tunnel and follow the straightforward path. Upon falling to a second floor to be met with a locked gate, crouch and enter the right-side passageway. Follow the straight-forward path until you arrive in a large room. Take cover and eliminate the security team. Work fast, the room will be flooding shortly. Eliminate the surround enemies and proceed along the left wall. You will approach a broken slanted piece of concrete, allowing you to proceed to the second floor. Proceed forward and you will view a balcony. Eliminate enemies from here and jump down. Proceed to the end of the room. Enemies will enter through a gate that will close shortly thereafter. Eliminate them. To the left of the gate (and directly before the pillar) is a small tower with a generator. Shoot the generator from a distance and the gate will be demolished by the falling tower. Proceed through the gate. Proceed through the new passageway and enter the left-hand passageway. Follow the straightforward path. Upon entering a room with small waterfalls, turn right and follow the straightforward path. Shortly afterward, you will enter part two of this mission. Proceed forward and take cover behind the right-side wall. Eliminate the guards. Ascend the staircase and climb up the pole. Turn left and enter the apartment through the window. Proceed forward and turn right to exit the apartment. Ascend the staircase and jump to the rooftop. Climb the wooden planks to reach the second rooftop. Take cover and eliminate the guards from your position. Afterward, proceed forward and jump down to another rooftop. Proceed to the wall, turn right, and enter the apartment. Turn right, take cover, and eliminate the enemies outside. Proceed outside and jump to the house where the enemies were positioned. Head forward, ascend the staircase, take cover, and eliminate the guards. Proceed forward and jump down to the crashed bus. Climb the pole on the opposite side. Take cover immediately and eliminate the snipers and approaching guards. Proceed to the left-side tower eliminating new enemies as you go. Climb the staircase and proceed for your first boss battle. When the target reticule and target appear on the screen, position the target reticule inside the target and press your fire button. Repeat this process until the boss fight ends. Proceed forward to the small device with a blinking red light. Patch into the cameras. Proceed forward (avoid the camera) and enter the second left-side alcove. Deactivate the camera via the power box. If you are caught, an elite squad will come to eliminate you. 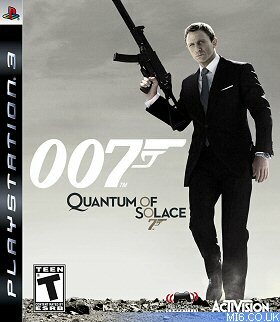 While this does not present a problem on lower difficulty settings, it can become a death trap on Agent or 007 modes. Afterward, proceed forward and enter the makeshift passageway. Your path will eventually be obstructed by misaligned bridges. To fix this, press the left-side switch once and the right-side switch twice. Proceed across the bridge. Turn right twice and left once. The game will equip your pistol. Crouch, attach the silencer and eliminate the guard with a headshot. 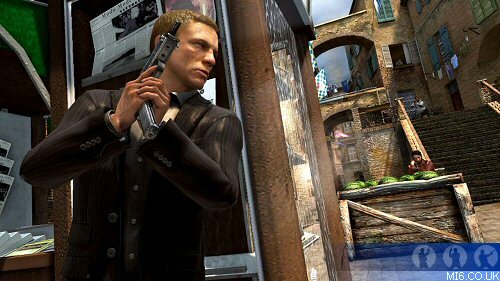 Apply your silencer to every weapon you use during this level to maintain stealth. Proceed forward, left, and proceed forward again to enter a small pond. To emerge upon the other side, proceed forward all the way. Afterward, turn right and then left. A guard will most likely be patrolling to your right side. Eliminate him. Proceed outside and take cover behind the brick wall. Eliminate the patrolling guard. Exit from cover and ascend the small ramp to the flashing console. Activate the console and a container will be lowered to create a makeshift bridge to the next portion. Proceed across the bridge, turn right, and ascend the ramp. Proceed forward and descend the right-side ramp. While avoiding the camera, duck into the alcove. Directly beneath the camera is its power box. While the camera looks away, sprint toward the power box and deactivate the camera. Turn around and proceed to the opposite end of the room. Turn left and you will see a window. Above this window is a security camera. Exit through the left-side door and crouch. Take cover behind the wall and examine the camera. Directly beneath it is the power box. When the camera looks ahead, sprint to the power box and deactivate the camera. Look to your left and you will discover another camera. The power box is located in the crawlspace directly underneath the camera. Exit the crawlspace, proceed up the stairs, and enter the room the camera was guarding. Exit through the left-side door, take cover, and eliminate the patrolling guard. Climb over your cover and proceed to the opposite end of the area. Turn left, enter the fence, and ascend the staircase. Turn left and you will see another small staircase. Ascend it. Turn right and climb up the ladder. Proceed forward and climb over the small bar. A second viewpoint will be visible – that of the sniper. You may shimmy across whenever the sniper is not looking toward the wall, either via the naked eye or his scope. Proceed forward and ascend the staircase. Proceed across the balcony and eliminate the sniper. He will fall and scream, but no guards will be alerted. Ascend the staircase he was guarding and a cinematic will be triggered. Equip your silencer. After the first easily identifiable guards, they are random and usually appear in any open space. A simple strategy is this. When you see a laser, crouch. 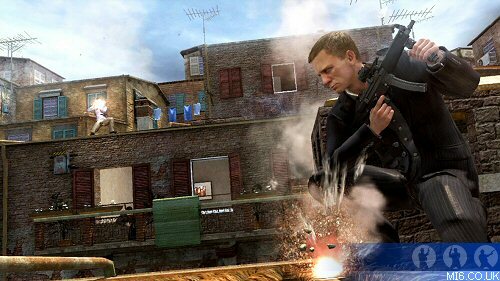 Quickly trace the laser sight to the guard and eliminate him. Upon eliminating enough snipers, a cinematic will be triggered. Equip your SAF .45 and proceed forward. Ascend the left-side staircase and take cover. Eliminate the two snipers atop the small buildings. Proceed to where they were positioned. Upon doing so, you will enter a mini-game of balancing. To avoid falling, utilize your movement keys to keep the ball centered as often as possible. Upon completing this mini-game, turn left and jump down to the lower balcony. Take note of the barred descending ladder to your left. Proceed across the balcony, open the yellow case, and equip a new gun. Take cover and eliminate the guards until a large explosion takes place. Remember that barred ladder? Descend it. Sprint across the deck – you’re looking to reach the road quickly. You will not receive significant damage from enemies - they will be killed by the explosions. After jumping across a large gap (which the game warns you of), the mission will end.